On 24 February, when ground operations started in earnest, coalition forces were poised along a line that stretched from the Persian Gulf westward 300 miles into the desert. The XVIII Airborne Corps, under Lt. Gen. Gary E. Luck, held the left, or western, flank and consisted of the 82d Airborne Division, the 101st Airborne Division (Air Assault), the 24th Infantry Division (Mechanized), the French 6th Light Armored Division, the 3d Armored Cavalry, and the 12th and 18th Aviation Brigades. The Vll Corps, under Lt. Gen. Frederick M. Franks, Jr., was deployed to the right of the XVIII Airborne Corps and consisted of the 1st Infantry Division (Mechanized), the 1st Cavalry Division (Armored), the 1st and 3d Armored Divisions, the British 1st Armored Division, the 2d Armored Cavalry, and the 11th Aviation Brigade. Between them these two corps covered about two-thirds of the line occupied by the huge multinational force. 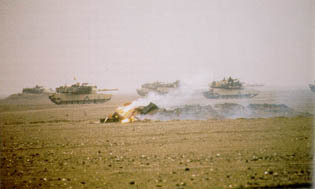 After thirty-eight days of continuous air attacks on targets in Iraq and Kuwait, President George H. Bush directed Central Command to proceed with the ground offensive. General Schwarzkopf unleashed all-out attacks against Iraqi forces very early on 24 February at three points along the allied line. In the far west the French 6th Light Armored and the 101st Airborne Divisions started the massive western envelopment with a ground assault to secure the allied left flank and an air assault to establish forward support bases deep in Iraqi territory. In the approximate center of the allied line, along the Wadi al Batin, Maj. Gen. John H.
The attack began from the XVIII Airborne Corps sector along the left flank. At 0100 Brig. Gen. Bernard Janvier sent scouts from his French 6th Light Armored Division into Iraq on the extreme western end of General Luck's line. Three hours later the French main body attacked in a light rain. Their objective was As Salman, little more than a crossroads with an airfield about 90 miles inside Iraq. Reinforced by the 2d Brigade, 82d Airborne Division, the French crossed the border unopposed and raced north into the darkness. Maj. Gen. James H. Johnson, Jr.'s 82d Airborne Division carried out a mission that belied its "airborne" designation. While the division's 2d Brigade moved with the French, its two remaining brigades, the 1st and 3d, trailed the advance and cleared a two-lane highway into southern Iraq-main supply route TEXAS-for the troops, equipment, and supplies supporting the advance north. 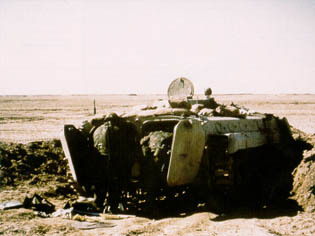 In XVIII Corps' mission of envelopment, the 24th Infantry Division had the central role of blocking the Euphrates River valley to prevent the escape north of Iraqi forces in Kuwait and then attacking east in coordination with VII Corps to defeat the armor-heavy divisions of the Republican Guard Forces Command. Maj. Gen. Barry R. McCaffrey's division had come to the theater better prepared for combat in the desert than any other in Army Central Command. Designated a Rapid Deployment Force division a decade earlier, the 24th combined the usual mechanized infantry division components-an aviation brigade and three ground maneuver brigades, plus combat support units-with extensive desert training and desert-oriented medical and water purification equipment. General McCaffrey began his division attack at 1500 with three subordinate units on line, the 197th Infantry Brigade on the left, the 1st Brigade in the center, and the 2d Brigade on the right. Six hours before the main attack the 2d Squadron, 4th Cavalry, had pushed across the border and scouted north along the two combat trails that the division would use, X-RAY on the left and YANKEE on the right. The reconnaissance turned up little evidence of the enemy, and the rapid progress of the division verified the scouts' reports. 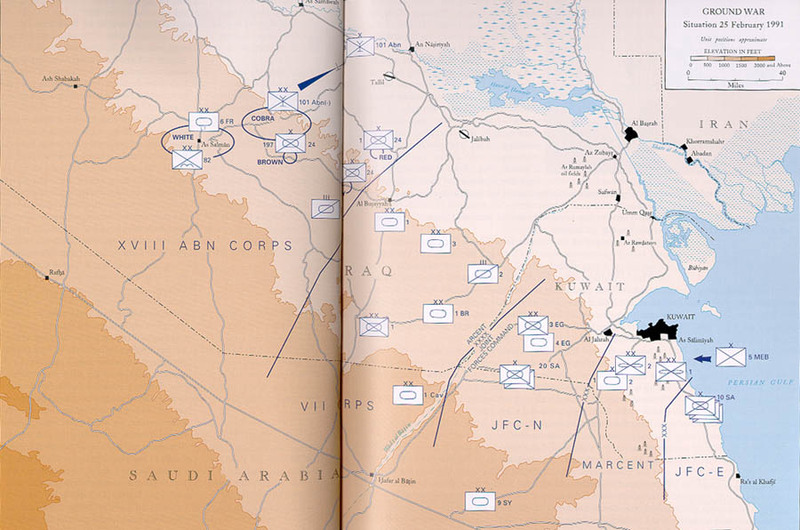 McCaffrey's brigades pushed about 50 miles into Iraq, virtually at will, and reached a position roughly adjacent to Objective WHITE in the French sector and a little short of forward operating base COBRA in the 101sts sector. Following a screen of cavalry and a spearhead of the 1st and 4th Battalions, 64th Armor, McCaffrey's division continued north, maintaining a speed of 25 to 30 miles per hour. 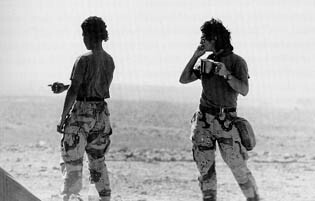 In the flat terrain the 24th kept on course with the aid of long-range electronic navigation, a satellite reading triangulation system in use for years before DESERT STORM. Night did not stop the division, thanks to more recently developed navigation technology. Unit commanders and vehicle drivers used image-enhancement scopes and goggles, and searched for targets with infrared- and thermal-imaging systems sensitive to personnel and vehicle heat signatures. Small units used hand-held Trimpack and Magellan global positioning systems. Around midnight McCaffrey stopped his brigades on a line about 75 miles inside Iraq. Like the rest of XVIII Airborne Corps, the 24th Division had established positions deep inside Iraq against surprisingly light opposition. The plan of advance for VII Corps paralleled that of Luck's corps to the west: a thrust north into Iraq, a massive turn to the right, and then an assault to the east into Kuwait. Because Franks' sector lay east of Luck's-in effect, closer to the hub of the envelopment wheel-VII Corps had to cover less distance than XVIII Airborne Corps. But intelligence reports and probing attacks into Iraqi territory in mid-February had shown that VII Corps faced a denser concentration of enemy units than did XVIII Corps farther west. Once the turn to the right was complete, both corps would coordinate their attacks east so as to trap Republican Guard divisions between them and then press the offensive along their wide path of advance until Iraq's elite units either surrendered or were destroyed. General Schwarzkopf originally had planned the VII Corps attack for 25 February. But XVIII Corps advanced so fast against such weak opposition that he moved up his armor attack by fourteen hours. Within his own sector Franks planned a feint and envelopment much like the larger overall strategy. On VII Corps' right, along the Wadi al Balin, the 1st Cavalry Division would make a strong, but limited, attack directly to its front. While Iraqi units reinforced against the 1st, Franks would send two divisions through berms and mines on the corps' right and two more divisions on an "end around" into Iraq on the corps' left. On 24 February the 1st Cavalry Division crossed the line of departure and hit the Iraqi 27th Infantry Division. That was not their first meeting. General Tilelli's division had actually been probing the Iraqi defenses for some time. As these limited thrusts continued in the area that became known as the Ruqi Pocket, Tilelli's men found and destroyed elements of five Iraqi divisions, evidence that the 1st succeeded in its theater reserve mission of drawing and holding enemy units. The two armored units moved rapidly toward their objective, the town of A1 Busayyah, site of a major logistical base about 80 miles into Iraq. The 1st Armored Division on the left along XVIII Corps' boundary and the 3d Armored Division on the right moved in compressed wedges 15 miles wide and 30 miles deep. Screened by cavalry squadrons, the divisions deployed tank brigades in huge triangles, with artillery battalions between flank brigades and support elements in nearly 1,000 vehicles trailing the artillery. In Vll Corps General Franks faced two problems. The British 1st Armored Division, one of the units he had to have when he met the Republican Guard armored force, had begun passage of the mine breach cut by the 1st Infantry Division at 1200 on the twenty-fifth, and would not be completely through for several hours, possibly not until the next day. With the 1st and 3d Armored Divisions along the western edge of the corps sector, and the British not yet inside Iraq, the 1st Infantry and 1st Cavalry Divisions lay vulnerable to an armored counterattack. On 26 February the XVIII Airborne Corps units turned their attack northeast and entered the Euphrates River valley. With the French and the 101st and 82d Airborne Divisions protecting the west and north flanks, the 24th Division spearheaded Luck's attack into the valley. The first obstacle was the weather. An out-of-season shamal in the objective area kicked up thick clouds of swirling dust that promised to give thermal-imaging equipment a rigorous field test through the day. After refueling in the morning, all three brigades of the 24th moved out at 1400 toward the Iraqi airfields at Jabbah and Tallil. 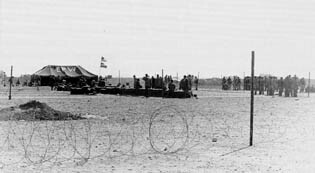 The 1st Brigade went north, then east about 40 miles to take a battle position in the northeast corner of the corps sector; the 2d Brigade moved 35 miles north to a position along the eastern corps boundary and then continued its advance another 25 miles until it was only 15 miles south of Jahbah; and the 197th Brigade went northeast about 60 miles to a position just south of Tallil. Meanwhile, the 3d Armored Cavalry screened to the east on the division's south flank. The Tiger Brigade now controlled the highest point for hundreds of miles in any direction. When the troops looked down on the highways from Mutla Ridge, they saw the largest target an armored brigade had probably ever seen. The previous night Air Force and Navy aircraft had begun destroying all vehicles spotted fleeing from Kuwait. Now the brigade added its firepower to the continuous air strikes. On the "Highway of Death" hundreds of burning and exploding vehicles of all types, including civilian automobiles, were visible. Hundreds more raced west out of Kuwait City unknowingly to join the deadly traffic jam. Here and there knots of drivers, Iraqi soldiers, and refugees fled into the desert because of the inferno of bombs, rockets, and tank fire. 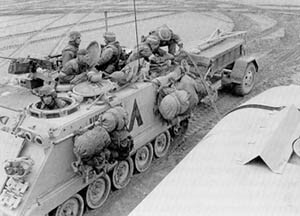 On the morning of 27 February XVIII Airborne Corps prepared to continue its advance east toward A1 Basrah. But before the assault could be resumed, the 24th Division had to secure its positions in the Euphrates River valley by taking the two airfields toward which it had been moving. Tallil airfield lay about 20 miles south of the town of An Nasinyah; Jabbah airfield lay 40 miles east southeast, near the lake at Hawr al Malih. The task of taking the airfields went to the units that had ended the previous day in positions closest to them. While the 1st Brigade would conduct a fixing attack toward the Jahbah airfield, the 2d Brigade planned to move east about 25 miles and turn north against the same objective. Moving north, the 197th Brigade would take Tallil. The dust storms had cleared early in the day, revealing in VII Corps' sector the most awesome array of armored and mechanized power fielded since World War II. In a panorama extending beyond visual limits 1,500 tanks, another 1,500 Bradleys and armored personnel carriers, 650 artillery pieces, and supply columns of hundreds of vehicles stretching into the dusty brown distance rolled east through Iraqi positions, as inexorable as a lava flow. 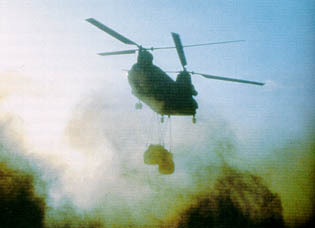 To Iraqi units, depleted and demoralized by forty-one days of continuous air assault, Vll Corps' advance appeared irresistible. Turning on the enemy the full range of its weapons, Vll Corps systematically destroyed Iraqi military power in its sector. 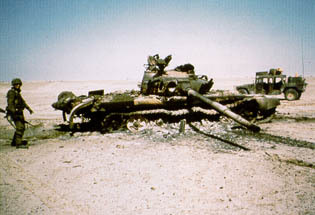 About 50 miles east of Al Busayyah, the 1st and 3d Armored Divisions tore into remnants of the Tawalzalaa, Madina, and Adnan Divisions of the Republican Guard. In one of several large engagements along the advance the 2d Brigade, 1st Armored Division, received artillery fire and then proceeded to destroy not only those artillery batteries but also 61 tanks and 34 armored personnel carriers of the Madina Division in less than one hour. The 1st Infantry Division overran the 12th Armored Division and scattered the 10th Armored Division into retreat. On the south flank the British 1st Armored Division destroyed the 52d Armored Division, then overran three infantry divisions. To finish destruction of the Republican Guard Forces Command, General Franks conducted a giant envelopment involving the 1st Cavalry Division on the left and the 1st Infantry Division on the right. Of the many successful aspects of Army operations in Operation DESERT STORM, three stand out. First, Army units moved so fast that they found their enemy consistently out of position and oriented in the wrong direction. In 100 hours of combat XVIII Airborne Corps moved its lead elements 190 miles north into Iraq and then 70 miles east. Even the armor-heavy Vll Corps drove 100 miles into Iraq and then 55 miles east. Iraqi units showed themselves unable to reposition even short distances before Army units were upon them. Starlight. Gathering and concentrating the faint light of the moon and stars, Starlight offered a view of terrain out to about 100 yards in shades similar to a photographic negative. It did not depend on a transmitted beam that an adversary could detect. Still, it had drawbacks, among them the system's need for a clear night as well as expense, weight, and size. So the early Starlight scopes had been distributed only to specialized units, such as long-range patrol and sniper teams. Other products of advanced technology contributed significantly to success. Two location and navigation devices, named Trimpack and Magellan by their manufacturers, minimized disorientation on the ground, a perennially serious problem that was magnified by the featureless desert environs of Southwest Asia. Trimpack (officially called the small lightweight global positioning system receiver) was dubbed "Slugger" by the troops. Both devices weighed about six pounds and were small enough to fit in a pack. They had solid-state electronics that read transmissions from orbiting satellites and gave their users precise coordinate locations. Both also determined firing data for artillery units, corrected azimuth bearings to objectives, and measured angles of descent for aircraft heading for landing zones or targets. Magellan and Trimpack rendered the age-old problems of map or terrain-reading errors obsolete. pronounced them superior. Fortunately, the initiative of key commissioned and enlisted personnel at the battalion and company levels bridged communications gaps at crucial times. In a curious split decision on a weapon, the M109 155-mm. field artillery piece won praise for fire effect on targets, but its self-propelling component proved underpowered to keep pace with mechanized and armored assaults. One piece of combat engineer equipment earned similar criticism. 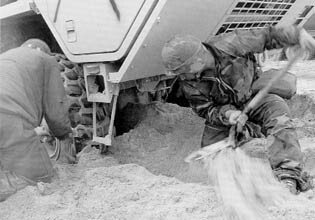 The M9 armored combat earthmover cut through berms easily but could not keep up with assaults over open terrain. After isolating and evaluating various aspects of Army operations and systems, questions remained about the overall course of the war and its outcome. Was the Army really as good as the overwhelming victory and one-sided statistics of the war suggested? Was Iraq's military really that weak? Complete answers awaited more careful analysis of the combatants, but in the immediate aftermath of the ground campaign two conclusions seemed justified. First, Iraq's military was not prepared for a war of rapid movement over great distances. The Iraqis, in their most recent combat experience against Iran, had developed skills at slow-paced, defense-oriented warfare. Those skills proved inadequate to stop an army with high-speed armor capabilities. Second, Central Command used its air arm to devastating advantage. With air supremacy established more than a month before the ground war began, the success of General Schwarzkopf's well-conceived and dreadfully misnamed "Hail Mary" play-the huge corps-size envelopment to the west-was assured. The relentless day and night pounding of aerial bombardment made easier the task of coalition units not in the envelopment, for when they attacked straight ahead into Iraqi positions, they found enemy units less than 50-percent effective. 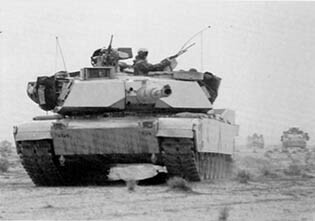 The combination of a powerful air offensive, followed by a fast moving armor-reinforced ground campaign, proved extremely effective in the desert environs of Southwest Asia. 1 Unless otherwise noted, material in this chapter is based on U.S. Department of Defense, Conduct of the Persian Gulf War, An Interim Report to Congress (Washington, D.C.: Government Printing Office, 1991), p. 4-6, Third U.S. Army, After Action Review, 12 Mar 91, Draft MS, Swain, Operational Narrative, and Robert H. Scales, Jr., Certain Victory: The United States Army in the Gulf War (Washington, D.C.: Office of the Chief of Staff, United States Army, 1993). 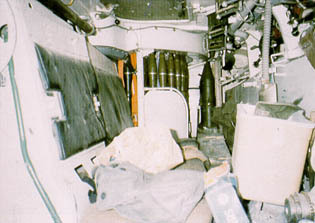 2 Army Focus, Jun 91, p. 22. 3 XVIII Airborne Corps Sitrep, 24 Feb 91, Peter David, Triumph in the Desert (New York: Random House, 1991), p. 78; Interv (telephone), Charles R. Anderson with Maj. Robert K. Wright, command historian, XVIII Airborne Corps, May 91. 4 Army Times, 11 Mar 91, p. 15; Wright interview. 8 Desert Shield and Desert Storm Operations Overview, 9 May 1991, prepared for United States Senate Armed Services Committee, Document no. 77 in HQ, 24th Infantry Division (Mech. ), Historical Reference Book (Fort Stewart, Ga., 1992), copy in CMH. 9 Interv, Maj. William H. Thomas III with Lt. Col. Edwin W. Chamberlain III, commander, 1/18th Infantry, 197th Infantry Brigade, 24th Infantry Division (Mech. ), 16 May 91. 10 Interv, Charles R. Anderson with Walter B. Morrow, Center for Night Vision and Electro-Optics, U.S. Army Communications-Electronics Command, Fort Belvoir, Va., 2 Jul 92. 11 MS, Doughty, War in the Persian Gulf, p. 15; Draft MS, Carver, Narrative of VII Corps in Operation DESERT STORM, pp. 3-4. 12 Army Focus, Jun 91, p. 22; Washington Post, 12 and 13 Sep 91; 1st Infantry Division (Mech. 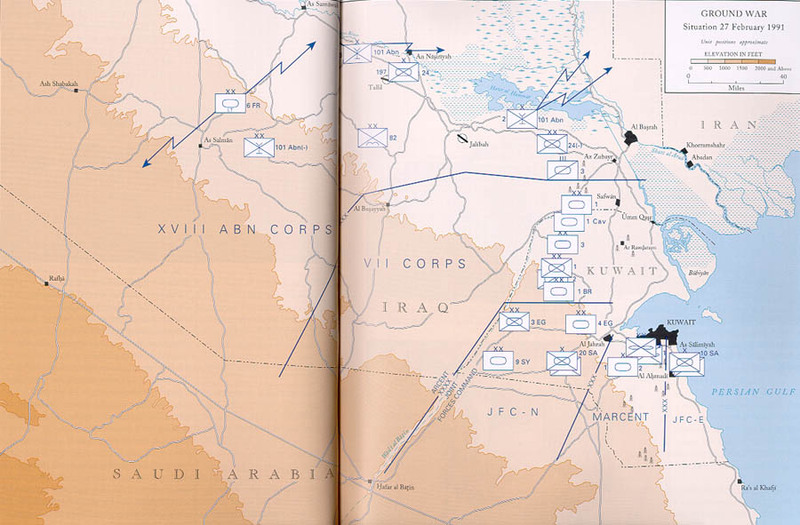 ), Operations DESERT SHIELD and DESERT STORM Command Rpt, 19 Apr 91, p. 4; VII Corps Commander's Sitrep (Combat) 38, 24 Feb 91. 13 VII Corps Sitrep, 24 Feb 91; MS, Maj. Guy C. Swan, 1st Armored Division in Combat, 21-28 February 1991, p. 1; Draft MS, Carver, Narrative of VII Corps in Operation DESERT STORM, p. 4. 14 Army Times, 11 Mar 91, pp. 14-15, Lt. Gen. Walter E. Boomer, Command Brief: Persian Gulf Campaign, U.S. Marine Corps Operations, n.d.; Intervs, Charles R. Anderson with Lt. Col. Ronald J. Brown, U.S. Marine Corps Reserve (USMCR) and Maj. Charles D. Melson (USMC, U.S. Marine Corps History and Museums Division, 2 Jul 91, Washington, D.C.
15 1st Brigade, 2d Armored Division, Commander's Summary, n.d.
17 Boomer, Command Brief: Persian Gulf Campaign; U.S. Marine Corps Operations, n.d. , Army Times, 11 Mar 91, p. 15. 18 Third U.S. Army, After Action Review, 12 Mar 91. 19 Maj. Gen. Barry R. McCaffrey, 24th Infantry Division (Mech. ): Operation DESERT STORM Post-Attack Summary, 18 Mar 91. 20 Ibid. ; Interv, Maj. William H. Thomas III with Col. John Lemoyne, commander, 1st Brigade, 24th Infantry Division (Mech. ), 7 Mar 91; XVIII Airborne Corps Sitrep, 25 Feb 91. 21 VII Corps, Desert Sabre Operations Summary. 22 Ltr, Mal Paul J. Jacobsmeyer to Col. K. Hamburger, Department of History, USMA, 7 Mar 91. 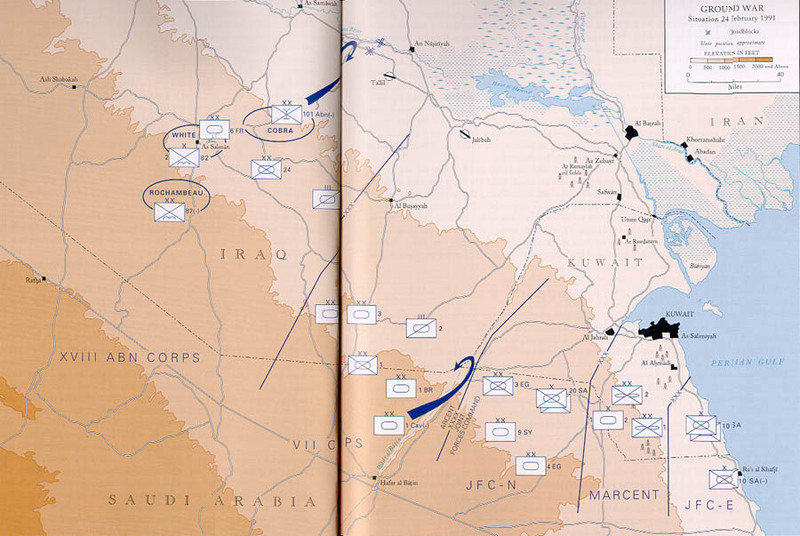 23 VII Corps, Desert Sabre Operations Summary, VII Corps Commander's Sitrep (Combat) 39, 25 Feb 91. 24 MS, Swan, 1st Armored Division in Combat, 21-28 February 1991, p. 1, Ltr, Capt. Kevin McKedy to "Dear Mil [sic] Artists," 9 Mar 91. 25 Army Times, 11 Mar 91, p. 14. 26 Brown interview; 1st Brigade, 2d Armored Division, Commander�s Summary, n.d.
27 ODCSINT Intelligence Summaries 404, 25 Feb 91, and 406, 26 Feb 91. 28 McCaffrey, 24th Infantry Division (Mech. ): Operation DESERT STORM Post-Attack Summary, 18 Mar 91, Lemoyne interview. 30 VII Corps Sitrep, 27 Feb 91 VII Corps Commander's Sitrep (Combat) 40, 26 Feb 91; 1st Armored Division Executive Summary-Operation DESERT STORM, 19 Apr 91. 31 VII Corps Sitrep, 27 Feb 91; VII Corps Commander's Sitrep (Combat) 40, 26 Feb 91; Third U.S. Army, After Action Review, 12 Mar 91; 1st Infantry Division (Mech. 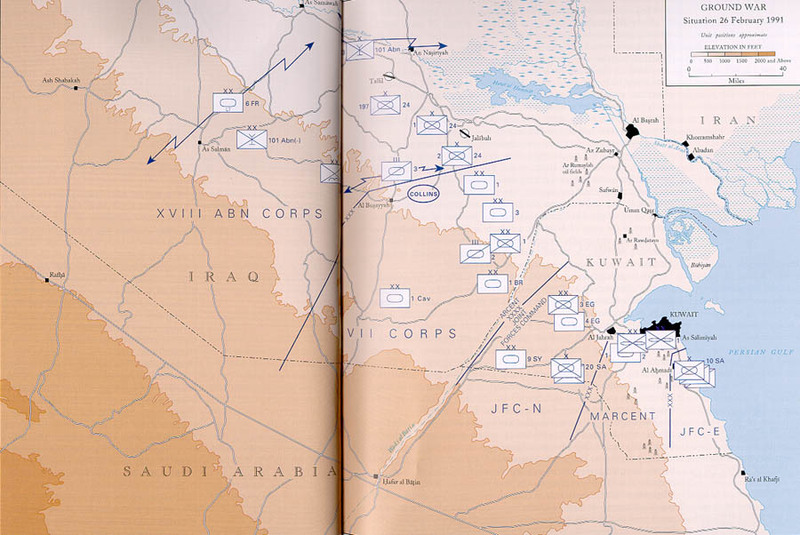 ), Operations DESERT SHIELD and DESERT STORM Command Rpt, 19 Apr 91, p. 5; 3d Armored Division, Historical Overview of the 3AD in the Persian Gulf War, p. 10. 32 Memo, Col. Michael D. Krause for Gen. Gordon R. Sullivan, 19 Apr 91, sub: Battle of 73 Easting. 33 Ibid., VII Corps Sitrep, 27 Feb 91. 34 VII Corps Sitrep, 27 Feb 91; VII Corps Commander's Sitrep (Combat) 40, 26 Feb 91; VII Corps, Desert Sabre Operations Summary; VII Corps DESERT SHIELD/DESERT STORM After Action Rpt, 29 May 91. 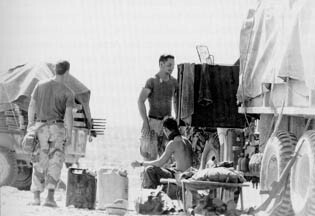 36 Boomer, Command Brief: Persian Gulf Campaign; U.S. Marine Corps Operations, n.d., 1st Brigade, 2d Armored Division, Commander's Summary, n.d.
38 ODCSINT Intelligence Summaries 406, 26 Feb 91, and 408, 27 Feb 91. 41 McCaffrey, 24th Infantry Division (Mech. ): Operation DESERT STORM Post-Attack Summary, 18 Mar 91. 43 Ibid. ; Interv, Maj. William H. Thomas with Maj. Gen. Barry R. McCaffrey, 28 Feb 91, Interv, Thomas with Lt. Col. David Jensen, commander, 3/7th Infantry, 1st Brigade, 24th Infantry Division, 9 Mar 91. 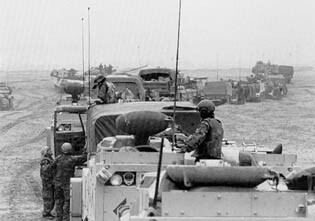 45 Third U.S. Army, After Action Review, 12 Mar 91. 46 Ibid., MS, Swan, 1st Armored Division in Combat, 21-28 February 1991, pp. 2-3; MS, VII Corps Public Affairs Office, VII Corps DESERT STORM History, p. 5; VII Corps, Desert Sabre Operations Summary; VII Corps Commander's Sitrep (Combat) 41, 27 Feb 91; 1st Armored Division Executive Summary-Operation DESERT STORM, 19 Apr 91. 47 MS, Doughty, War in the Persian Gulf, p. 16, MS, Swan, 1st Armored Division in Combat, 21-28 February 1991, p. 3. 48 MS, Doughty, War in the Persian Gulf, p. 17; MS, Carver, Narrative of VII Corps in Operation DESERT STORM, p. 7. 49 Boomer, Command Brief: Persian Gulf Campaign; U.S. Marine Corps Operations, n.d., 1st Brigade, 2d Armored Division, Commander's Summary, n.d.
91; Washington Post, 13 Jun 91. 52 VII Corps Sitrep, 27 Feb 91. 53 MS, Lt. Col. Gregory Fontenot, commander, 2/34th Armor, Attack on Objective NORFOLK, 26 Mar 91, p.1. 55 John F. Morton, "DARPA, Industry Fielded Antifratricide Device in 19 Days," Armed Forces Journal International (May 1991): 58, 60; Interv, Charles R. Anderson with Walter B. Morrow, Center for Night Vision and Electro-Optics, 27 Jun 91, Fort Belvoir, Va.
57 Ibid. ; Chamberlain interview; Memo, Lt. Col. Fontenot, 8 Mar 91, sub: Operation DESERT STORM After Action Report; MS, Swan, 1st Armored Division in Combat, 21-28 February 1991, p. 2.